Welcome to Hunter Street. Recently, Nickelodeon announced their new TV series will premiere later this month. The comedy adventure “follows the journey of five foster kids on a quest to find their missing parents, Erik (Ronald Top) and Kate Hunter (Tooske Ragas), after they mysteriously disappear.” The cast also includes Stony Blyden, MaeMae Renfrow, Kyra Smith, Daan Creyghton, and Thomas Jansen. Hunter Street premieres on March 13th at 7 p.m. ET/PT. Burbank, Calif.–Feb. 23, 2017–Nickelodeon enters the world of mystery and adventure in the brand-new live-action series Hunter Street, premiering Monday, March 13, at 7:00 p.m. (ET/PT). The new 20-episode series follows the journey of five foster kids on a quest to find their missing parents, Erik (Ronald Top) and Kate Hunter (Tooske Ragas), after they mysteriously disappear. 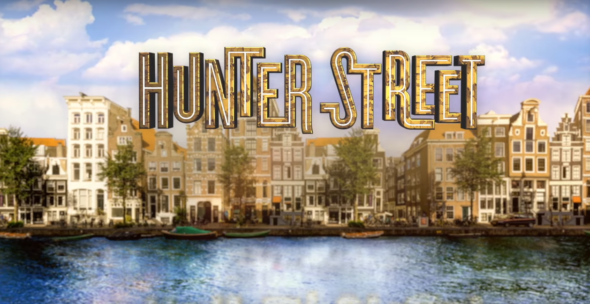 Hunter Street will air weekdays at 7:00 p.m. (ET/PT) on Nickelodeon. What do you think? Do you watch Nickelodeon? Will you check out Hunter Street? I really enjoyed watching Hunter Street with my grandchildren. It was a show that was interesting enough to hold all of our attentions. It not a “demeaning baby show” as my six yr. old granddaughter calls them. Please tell me there is going to be a season 3, 4, 5, 6, etc.